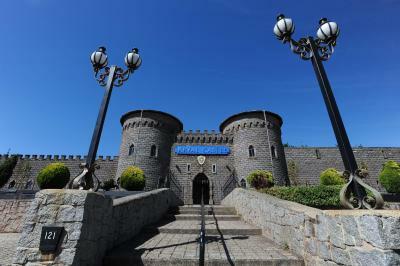 Lock in a great price for Kryal Castle Ballarat – rated 8.3 by recent guests! They tried to upscale the room with coffee & tea, biscuits, dishes & some flatware, this was appreciated. They also stocked the fridge with chargeable drinks. Liked seeing the castle grounds from 2- 3 pm- included in the price. Bed was comfortable& bathroom was nice. & if not for power going off - we could've gotten a good nights sleep here. Room had everything we needed, comfy queen bed, good quiet air conditioning, fantastic location (we really enjoyed our time at the castle and being able to wander around after closing). Breakfast vouchers were included and it was very nice. We had room 18 that had its own courtyard and gates- the only room to do so. We utilized the delvr.com.au as no food available. This was a good service and we ordered right on 5pm and dinner- 7 choices- arrived by 6:15pm. Good heating in room which is a must for the cold weather. Room is prepared with plates, microwave, table and chairs ready for food deliveries. Secure monitored parking. Amazing rooms in a fantastic location. Unique experience. Expected the room to be run down but we were actually quite impressed! Very nice and clean and the staff were extremely helpful. It was lovely to stay in a real castle. Love the atmosphere. Beautifully appointed room with everything we needed included as well as a continental breakfast in the morning. Would highly recommend for families with kids. Kryal Castle Ballarat This rating is a reflection of how the property compares to the industry standard when it comes to price, facilities and services available. It's based on a self-evaluation by the property. Use this rating to help choose your stay! 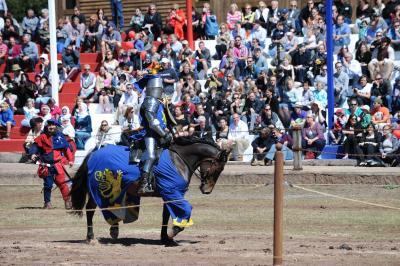 Featuring action-packed Castle Arena live shows, Kryal Castle is a Medieval Adventure Park and Resort that offers a unique combination of entertainment and accommodations. 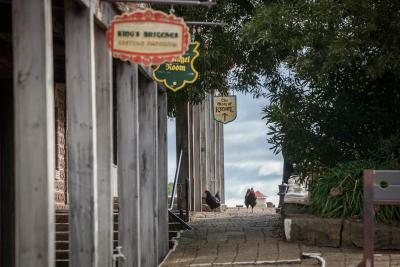 Guests enjoy free WiFi and, on weekends, Victorian school holidays and public holidays, access to over 12 medieval attractions, a restaurant and a bakery. Children can get their faces painted at the Fairies and Goblins Wonderland, or experience the Jester’s Theater Show. Other attractions include a Torture Dungeon & Museum and the Dragon’s Labyrinth. All themed suites have been designed with arched doorways and decorated with hand-woven French and Belgium tapestries. They include a microwave, refrigerator and toaster. Some feature a spa bath. Mount Xavier Golf Course, Ballarat town center and Ballarat Wildlife Park are all within 15 minutes’ drive of Kryal Castle Adventure Park. The on-site Mountain Inn Bakery is open daily during park operating Hours. 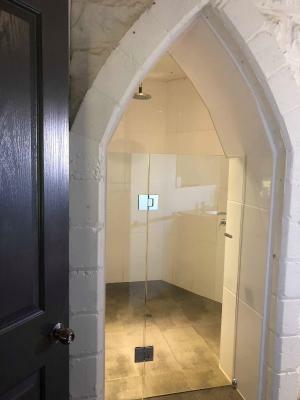 When would you like to stay at Kryal Castle Ballarat? This air-conditioned suite features a 40-inch flat-screen TV, tea/coffee making facilities, a refrigerator, microwave and a toaster. Please note that the price is based on 2 guests and includes entry to Kryal Medieval Park on the weekends, during public holidays, as well as Victorian school holidays. This air-conditioned suite features a 40-inch flat-screen TV, a refrigerator, microwave, toaster and tea/coffee making facilities. It also offers beautiful views over Ballarat and surrounds. Please note the price is based on 2 guests and includes entry to Kryal Medieval Park on the weekends, during public holidays, as well as Victorian school holidays. This air-conditioned suite features a 40-inch flat-screen TV, refrigerator, microwave, toaster and tea/coffee making facilities .It also offers beautiful views over Ballarat and surrounds. This room has a double bed, a separate room with bunk beds, air-conditioning and features a 40-inch Smart TV, refrigerator, microwave, toaster and tea/coffee making facilities. Experience the intrigue and mystery of the medieval fortress and wander the grounds of The Castle, taking in the beautiful views over Ballarat and the surrounding region. 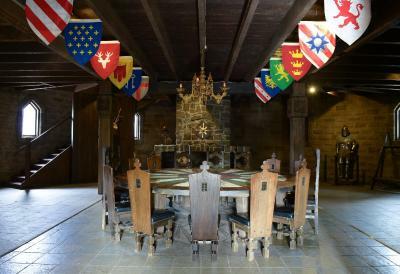 The Medieval Adventure Park is open on weekends, Victorian school holidays, and Victorian public holidays from 10am – 4pm. Accommodation in Castle Suites is available 7 days a week and midweek guests will have The Castle to themselves outside of normal opening hours. 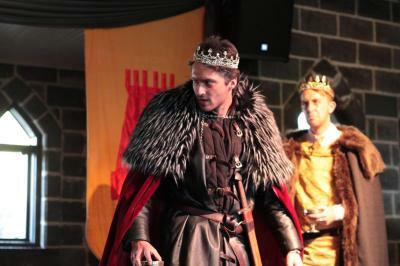 House Rules Kryal Castle Ballarat takes special requests – add in the next step! Kryal Castle Ballarat accepts these cards and reserves the right to temporarily hold an amount prior to arrival. 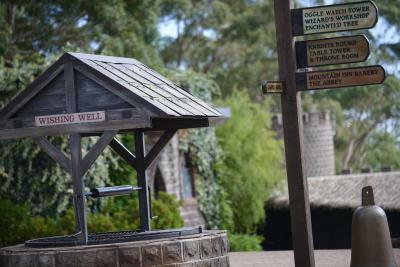 Medieval Adventure Park is open on weekends, school holidays, and public holidays from 10:00 until 16:00. 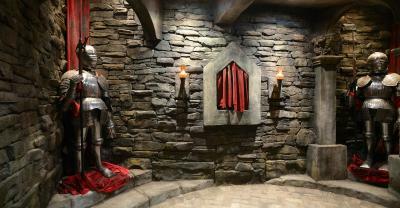 Kryal Castle remains open all week to guests. Please note that the front entrance to Kryal Castle is on Forbes Road. Car parking for guests is via the rear of the property, through Artisans Gate. Reception hours are from 09:00 to 17:00. 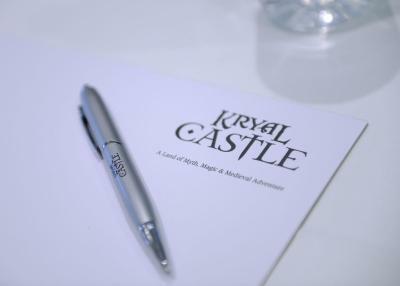 If you expect to arrive outside reception opening hours, please inform Kryal Castle in advance, using the contact details found on the booking confirmation. Please inform Kryal Castle Ballarat of your expected arrival time in advance. You can use the Special Requests box when booking, or contact the property directly using the contact details in your confirmation. Breakfast average and inexperienced staff. Breakfast was short on staff. The castle and its school holiday activities were amazing. The breakfast could be much better. The fan for the bathroom is not able to be turned off and it's super loud. Cannot use the light for the bathroom without lighting up the whole room No curtain for the window so lots of light coming through And very thin walls, could hear other guests all night. The dirt car park out the back. Way out of town and takes a bit to get to. On the plus side was quiet and away from traffic. The country atmosphere was divine. 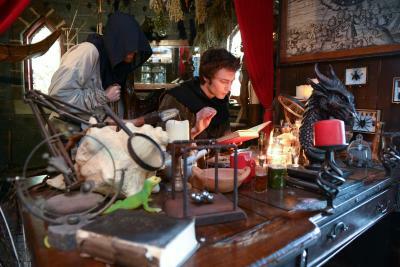 It had lotsss of medieval stuff. A made of stone...loved it. Breakfast was not tasty and service quite slow, was not very busy. Scenery, murder mystery night and dinner was excellent! The room was cold and crackers around door so cold wind coming in all night. We had booked a spa bath but the bathroom was so cold we didn't use it, even choose not to shower in the morning. The toilet seat was unstable . I would have mentioned to the check out staff but it was only a key drop off.